Hand-tied bouquets are wonderful and have a wide appeal. They are virtually suited to any occasion from a birthday to Mother’s Day an anniversary to a get well gift. They are also perfect for weddings and on the opposite end of the scale, as funeral tributes.You can make a hand-tied look at minimalist or as full as you want to create different effects. It can be natural with a “just picked” look, or structured with an imaginative use of leaves and grasses. 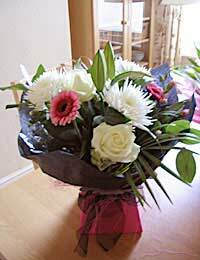 A hand-tied bouquet really is a perfect gift because if it is done correctly, all, the person who is receiving it, should have to do, is place it in a vase. The beautifully round shape tied at just the right point will look as though you’ve spent hours arranging your flowers to look just perfect!pIn fact this type of bouquet is very quick and simple to make once you have mastered the technique. You just need to remember that although the basic principle of hand-tied always remains the same, the choice of flowers and foliage will vary depending on the type of design you are after. Generally any flower or foliage with a sturdy stem is perfect for this design. The longer the stem the better as this gives you more flexibility when cutting it down.Chrysanthemums, carnations, roses and lilies are perfect flowers for a gift bouquet, while a bridal bouquet would need smaller headed flowers, more tightly packed with delicate foliage such as soft ruscus or ivy. Mimosa, small headed roses and lily of the valley are perfect. Palm leaf, hosta leaves and leatherleaf are perfect for framing a larger hand-tied design. Roses and lilies are one of the most popular choices for hand-tied. Roses are beautiful in any colour and exude luxury while lilies add that touch of the exotic. The roundness of the roses and the linear shape of a lily still in bud complement each other beautifully and the fragrance can fill a room. Both lilies and roses are widely available now and not just for the luxury end of the market. You really can create a lovely hand-tied bouquet for a fraction of the cost of what it did a decade ago. Lily pollen is notorious for causing stains, so if any of the lilies you use are open then remove the stamens. Always remove all the thorns from the rose stems and any leaves which will be below the water level. Place three sections of chrysanthemums in a clockwise direction at an angle while at all times holding the bouquet lightly in your hand and keeping the stems going in the same direction. This is tricky but practice does make perfect in this case! Carefully tie it with pre cut string and bind this for added security with tape before cutting the stems to the required height – and at the same level. You can test this by seeing whether the bouquet will stand up by itself. A properly packed hand-tied can look amazing. Placing aqua-packed bouquets in decorative boxes is very popular these days. It’s like presenting the bouquet complete with a vase. These boxes can be bought very cheaply from a good floral wholesaler. Cut twice the amount of cellophane you need and place a coloured sheet of tissue which will complement on one half of the cut cellophane. Fold the cellophane. Put the bouquet on top of the cellophane in the middle. Pull up top create a collar around the bouquet and secure with sellotape. As added security, tie with a piece of coloured string at binding point. Pour water into the cellophane and then place bouquet in the box. Add a beautiful coloured bow and even some coloured sisal to create the perfect gift.